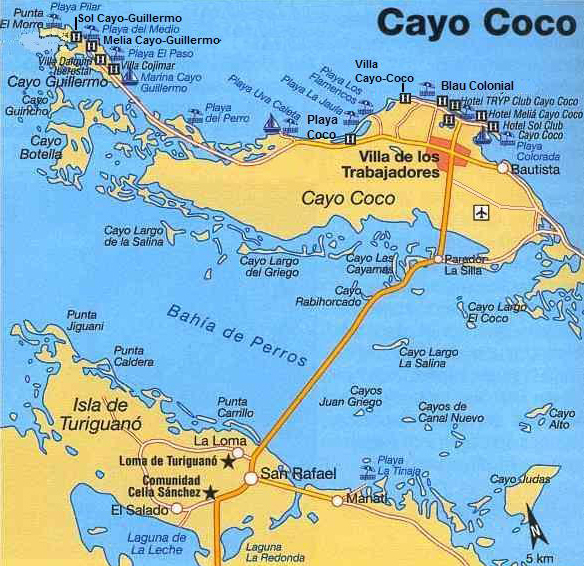 While beautiful in terms of nature, Cayo Coco is hardly part of typical Cuba. These islands are isolated from the mainland, connected only by a man-made causeway several kilometers long. Access is controlled by a security checkpoint. The best way to get around the cays is by moped, or bicycle if you’re feeling especially fit. Most of the hotels have mountain bikes (free for guests) and mopeds that rent for CUC$25 to CUC$35 a day. There is a tourist bus that makes the entire circuit from one end of Playa Coco to the far end of Playa Guillermo. The bus runs around every 11/2 hours and costs CUC$5. Official taxis are pretty expensive for long distances. Due to high demand and isolation, car rental rates are relatively expensive on the cays. As in any third world country, most of the merchandise available is designed for tourists to take back home. The biggest Cuban exports for tourists are rum, cigars, and coffee, all of which are available at government-owned stores or on the streets. For genuine merchandise, you should pay the official price at the legal stores. Real-looking discount cigars of dubious authenticity being offered by street touts. "Friendly" locals inviting tourists to bars for a drink (normally a Mojito) or to a restaurant; the tourist will be charged two to three times the normal price, and the spoils split between the establishment and the "friend". Short-changing in bars or taxis or giving national pesos (CUP) in change for convertible pesos (CUC). Being that all restaurants are owned by the government and run by underpaid employees, the food in Cuba is notoriously bland. Within Cuba, the best food will generally be found in your casa particular or in paladares (locally owned restaurants in private homes). CUC is the currency most tourists will use in Cuba. It is how you will pay for hotels, official taxis, entry into museums, meals at restaurants, cigars, rum, etc. Conversion into CUC can be done at exchange houses (casa de cambio, or cadeca). These are located in many hotels and in other places throughout the cities. The Euro is widely accepted, unfortunately the US$ is not. ATMs are rare in Cuba. Credit cards are not widely accepted. The official language of Cuba is Spanish. The emergency number in Cuba is: 116. In many cities the only way for tourists to access the internet is through the government's communications centers ( ETECSA ), it is not cheap and there is good chance that someone is "watching" your doings on the PC. Shopping hours : Mon-Sat 0900-1700, Sun 0900-1200. January 1st: January 1st is celebrated as a public holiday throughout the rest of the world because it is New Year. Although this same date is celebrated as a public holiday in Cuba, the reason for this public holiday in Cuba differs. January 1st is a public holiday in Cuba because it is Liberation Day. January 28th: This date is special in the history of Cuba because it is the birthday of Jose Marti, the father of Cuban independence. April 19th: This day is commemorated in Cuba every year because it marks the anniversary of the Cuban victory at the Bay of Pigs in 1961, when US-backed Cuban exiles tried to invade Cuba and topple the Socialist Government. May 1st: Like much of the world, 1st May is Labour Day and this is a public holiday in Cuba. July 30th: This day is celebrated in Cuba to commemorate the martyrs of the Cuban revolution in 1959. August 12th: This is the date that the Cuban dictator Machado was overthrown in 1933. October 8th: Special ceremonies take place in Cuba annually on this day to remember the murder of Cuban revolutionary leader Che Guevara in 1967. October 10th: This is an official public holiday in Cuba and schools and offices are closed on this day. This public holiday in Cuba is known as the day of Cuban culture. December 25th: Although the socialist government in Cuba have stamped down hard on religion in general and Catholicism in particular, Christmas day is still celebrated as a public holiday in Cuba.